Sometimes things come into my mind and I have no idea what triggered them. Today is Yom HaShoah, the day remembering the murder of six million Jews in Europe during the Holocaust. For some reason, this day reminded me of the famous “Ladder of Maimonides” or “Ladder of Justice/Righteousness.” Maimonides (1135-1204) was born 800 years before the Holocaust, and so I do not know how or why my brain would have made that connection. Nevertheless, Maimonides is an example of many things. Living in Moorish Spain, he was part of an extraordinarily open and tolerant society. In what is called convivencia, literally “living together,” Jews, Muslims and Christians lived together in mutual respect. Each faith tradition made its unique contribution to the overall good of society. Moses ben Maymun (in Arabic Musa bin Maymûn, and Greek Maimonides) was born in Córdoba, one of the most important cities in the world in his time. Maimonides is affectionately known as Rambam (from Rabbi Moses Ben Maymun) by Jews to this very day. Like many of the great figures in the Middle Ages, he was a man of many skills. He was a physician, a rabbi and a philosopher. He engaged in the theological and philosophical discussions of his day. His book, “Guide for the Perplexed,” is an attempt to show that religions — in his case, Judaism — were not merely superstition but were built on reason. However, it was Maimonides’ famous “Ladder of Justice/Righteousness” (sometimes called the “Eight Levels of Charity”) that came into my head this morning. In eight simple steps, he described how humanity climbs from injustice to justice, toward a greater spirit of charity. It is a model for building a more just and compassionate society. In a world of suffering, injustice, displacement and dehumanizing poverty, people of good will are struggling to alleviate the suffering of our fellow human beings. CNEWA works in many parts of the world — the Middle East, Africa, India — where these issues seem overwhelming and almost insoluble. Perhaps today, Yom HaShoah, a moment when we reflect on one of the greatest injustices of modern history, is a fitting time to recall this great Jewish philosopher, as he reminds us what comprises justice and righteousness — and challenges us to better reflect that in our world today. The person who gives reluctantly and with regret. The person who gives graciously, but less than one should. The person who gives what one should, but only after being asked. The person who gives before being asked. The person who gives without knowing to whom he or she gives, although the recipient knows the identity of the donor. The person who gives without making his or her identity known. The person who gives without knowing to whom he or she gives. The recipient does not know from whom he or she receives. The person who helps another to become self-supporting by a gift or a loan or by finding employment for the recipient. Maronite Catholic Patriarch and Lebanese Cardinal Bechara Peter appealed to world leaders to stop the war in Syria and to work for comprehensive peace through diplomatic means. “As the great powers are beating the drums of a new war against Syria, we regret the absence of a language of peace from the mouths of senior officials in our world today,” he said, in an address 12 April directed to the international community. “We appeal to the conscience of the great powers and the international community to work to end the war and to bring about a just, comprehensive and lasting peace through political and diplomatic means — not military,” the church leader stressed. The patriarch’s appeal came amid threats of military retaliation against Syria over the alleged use of chemical weapons against civilians in the Ghouta region. Opponents of unilateral U.S. action schedule an emergency closed-door meeting of the U.N. Security Council 12 April, and Britain also scheduled an emergency Cabinet meeting, the Associated Press reported. During the years of displacement, our sisters worked at every camp for internally displaced persons. We led Christian catechism programs and activities. With the help of CNEWA and other organizations, we were able to distribute different items — such as clothing, mattresses, milk and diapers, etc. We felt that it is our responsibility to help our people. We ourselves were displaced, also, which helped us understand the needs of displaced families; we knew what they were going through. We sisters have our own struggles, of course. We have asked different speakers to help us cope with the situation, spiritually and psychologically. We are grateful to all those who have risked their lives and have come to show solidarity and offer their knowledge. Deep down, we believe our main help is the Risen Lord around whom we gather in every Eucharist. This unites us with the Christ and enables us to endure. Sharing with one another our difficulties gives us the opportunity to reflect and support one another. We have lost much, but we still have each other. And that is of great help. Read more of her Letter from Iraq in the current edition of ONE. “There is no good and bad war, and nothing, nothing can justify the use of such instruments of extermination against defenseless people and populations,” the pope said 8 April before concluding Divine Mercy Sunday Mass in St. Peter’s Square. A suspected chemical weapon attack occurred late 7 April when Syrian army warplanes allegedly flew over and bombed the eastern town of Douma, located 15 miles north of the Syrian capital, Damascus, according to the Reuters news agency. Pope Francis prayed “for all the dead, for the wounded, for the families who suffer” and called for world leaders to abandon the use of war as a means of gaining peace and stability. “We pray that political and military leaders choose the other way: that of negotiation, the only one that can lead to a peace that is not that of death and destruction,” the pope said. Our faith always calls for peace, but politics and bad politicians are always setting fires and disturbing the situation. I try to stay away from political discussions. My mission is to take care of my parish, to help my parishioners and to try and enrich the parish with fruitful spiritual activities. While Syria’s many Christian communities face many and varied challenges right now, there is only one thing we all truly need: peace. During this Easter season, a time of renewal and hope, we pray to the Prince of Peace to uplift and console the Syrian people, and bring them the peace they so urgently desire. To learn more, and offer your prayerful support, please visit this page. Thank you and God bless you. I was amazed to see how many Iraqi youth came out on a cold, dark night in the dead of winter to engage in worship and meaningful spiritual dialogue and teaching with two Lebanese religious sisters. One sister was perhaps just a few years older than the young people, yet greatly admired; the other was a now much-beloved mother figure. They do this at least twice a month at the home of the Franciscan Missionaries of Mary in the Jordanian capital, Amman. There, they experience warm fellowship and the opportunity to express themselves freely as they grapple with the still-fresh wounds of being forced out of their ancestral home by ISIS militants. They also have the opportunity to transform their pain and open their spirituality to God’s plan for their lives. They seek to grow by engaging in the spiritual formation and catechesis activities the Franciscans offer in a very natural atmosphere. One of the young people, Ra’ed Omar says the program facilitated by the Franciscan Missionaries of Mary involves prayer, teaching, discussions, spiritual exercises, meditations and fun. At times, there may also be a Mass and a talk by a priest. “They have influenced me a lot,” he says. “I’ve learned so much. It’s a great atmosphere. I was far away from the church in Iraq, but in Jordan I came closer to the church, to God and His people. It’s been a spiritual encounter providing an opportunity, too, to learn how to love others without expecting anything in return,” he says of this youth group’s outreach to Iraqi children, orphans and others in desperate situations. That same conviviality is found among a group of young-to-middle-aged Jordanian women, many of whom are professionals, meeting every Tuesday at the sisters’ home for Bible study and a discussion of spiritual topics. There, a Jordanian Franciscan religious sister oversees the activities while encouraging the women to engage actively in learning about God’s love and the tenets of the Christian faith that they hold so dear. Sister Sana served with the Franciscan Missionaries of Mary in Syria’s trouble spots of Raqqa, Aleppo and Damascus before taking up her post in Amman last year. “The goal for these women is to take responsibility for their discovery and learning along their spiritual walk. I want to see them following Jesus, enjoying a deep relationship with him in a profound way and understanding,” says Sister Sara. “This depth of spirituality will also impact and benefit the lives of their families and others they interact with and for whom they are responsible. At the end of the day, they should take hold of their spiritual growth because they, too, are the Church,” she says. 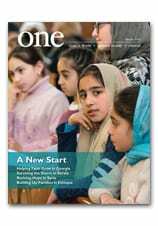 Read more about Inspiring the Faithful in Jordan in the March 2018 edition of ONE.